Corruption works like an invisible worm that furtively penetrates deep, deep into the body of its victims, attacking vital organs, compromising immunity systems and ultimately destroying the body itself. Corruption has been famously described as something that happens in other countries, reflecting how practices considered the norm in certain cultures, e.g. payments for introductions to high-ranking officials, might be considered a corrupt practice elsewhere. Corruption is at its most dangerous when it becomes the cultural norm: the dominance of the media by press barons being one example of what is harmful yet goes unchallenged. But there is a huge amount of hypocrisy surrounding the corruption debate. We have argued elsewhere that the focus on bribe-taking has cast the spotlight in the direction of poorer countries, often those which have been forced by IMF policies to slash public spending and the salaries of senior officials. Politicians in richer countries, however, have largely turned a blind eye to corrupt practices under their own noses. Nowhere more so than Britain, where politicians have rightly come under sustained attack over their parliamentary expenses. But Britain is also the Big Daddy of the secrecy jurisdiction world, with the City of London sitting at the centre of a vast web of such places, most of them former colonies, which provide the perfect operational environment for activities at the top end of the corruption spectrum. This includes activities like market-rigging, insider-trading, illicit payments of all types, and tax evasion. The big hypocrisy lies with the way in which British politicians, backed by armies of think-tanks, learned academics, journalists and uncle Tom Cobbley and all, talk the talk of free markets, but walk the walk of asymmetric information, secrecy, covert payments, political intervention, hidden subsidies, gagging orders, libel tourism, anything and everything to distort and undermine fair competition. The Brits like to tut-tut about their Gallic colleagues, but the truth is that examining magistrates in France have fought with huge integrity against the machinations of the political elite, the Elf Acquitaine case being a prime example, while British companies seem to have the senior politicians in the palms of their hands. The revelations surrounding the operations of British weapons manufacturer BAE are symptomatic of all that's wrong about Britain's political economy. Disgraced former Prime Minister Tony Blair has been deeply implicated in the sale of a hugely expensive and complex radar system to cash-strapped Tanzania. It has now been revealed by the Serious Fraud Office that a significant proportion of the contract price went into offshore bank accounts. "Every way you looked at it, it [the deal] was outrageous and disgraceful. And guess who absolutely insisted on it going through? My dear friend Tony Blair, who absolutely, adamantly, favoured all proposals for arms deals . . . It was an obviously corrupt project. Tanzania didn't need a new military air traffic control, it was out-of-date technology, they didn't have any military aircraft – they needed a civilian air traffic control system and there was a modern, much cheaper one. Everyone talks about good governance in Africa as though it is an African problem, and often the roots of the 'badness' is companies in Europe." One Tanzanian politician has subsequently been found to have stashed over half a million pounds into a Jersey bank account under his control. He claims it has no link to the BAE sale, but no other explanation for its origin has been forthcoming. But which of the parties involved is guilty of corruption: the payee? the payor? the enabling bankers who fail to ask awkward questions? 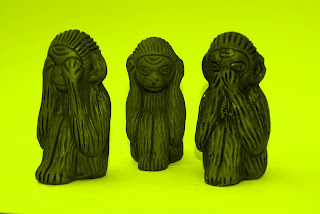 the banking regulators who play the role of the three monkeys? or all four? In our heart of hearts we all know the fifth answer is the correct one.